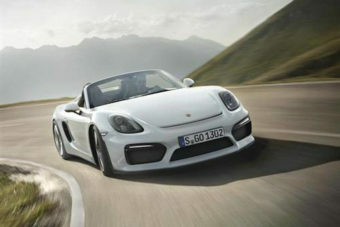 The new Porsche Boxster Roadster is claimed by many to be the best all-rounder in this sector. There are no denying its strengths – powerful engines, crisp handling, and surprisingly low running costs. Even better, it’s what you could even call affordable. The Boxster has been setting the standards against which all other small roadsters are measured for quite some time now. Unlike its rivals, its engines are plonked in the middle, which is good for balance. It comes with a fabric roof which folds down in less than ten seconds so that you can enjoy the sunshine out on the open road, and it’s also practical. If you’re finally in a position to afford a Porsche and quite fancy a racy sports car, join OSV as we take a closer look at what the new Porsche Boxster Roadster is all about. Few cars on the road at the moment offer as much fun as the Boxster, and that’s part of its inherent appeal. But while the Boxster will definitely appeal to those of you who just want to cruise along with the roof down, it’s also got a lot to offer any keen driving enthusiasts among you. The steering is sharp and accurate, while the throttle has plenty of response. But it’s the range of powerful engines that really make this sports car come alive. The entry-level 2.5-litre petrol engine kicks things off. It can deliver up to 261bhp, and can do 0-62mph in just 5.8 seconds. 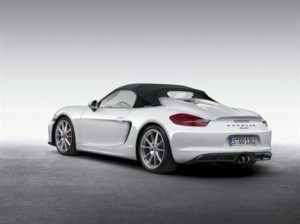 The Boxster S does 0-62mph in 5.1 seconds, and is backed up by a 3.4-litre petrol engine that produces 311bhp. The Boxster GTS is also powered by the 3.4-litre petrol engine but has 15bhp more power, and it knocks a tenth of a second off the 0-62mph time if you psi it up with a manual gearbox and four-tenths of a second if you go for the PDK automatic ‘box. In this guise, the Boxster is quicker than the base-level 911. The Spyder is the fastest of them all, though. Powered by a savage 3.8-litre 369bhp engine that you’ll also find in the 911, it can do 0-62mph in 4.5 seconds, before maxing out at 180mph. The throttle is responsive, while the 6-speed manual transmission works well. Use all of the performance of the engine and you’ll be doing over 80mph in no time at all. All the engines sound great, even if you don’t put the roof down. If, however, you fancy a more serene driving experience from time to time, the retractable canvas roof keeps external noise to a minimum. Just go with whatever suits your mood at the time. A 6-speed manual gearbox is available as standard, but the 7-speed PDK automatic is an attractive option. It’s fast! Overall, the ride quality is good but can feel overly firm at times. The GTS and Spyder models get PASM adaptive dampers as standard, but they’re only available as optional extras with the Boxster and Boxster S models. From the outside, the new Boxster Roadster looks very similar to the outgoing model, with Porsche clearly believing that if something isn’t broken, there’s no point trying to fix it. Yet despite outward appearances, each external component barring the windscreen, bonnet and tailgate has been changed. It actually looks wider and more aggressive than last time around, while the addition of front and rear LED lights makes it visually more compelling. There is no doubt that this is a beautiful interior, with mostly everything well laid-out. A minor criticism is the fiddly switches, but they don’t take too long to get used to. The seats offer plenty of comfort and adjustment so that even taller drivers should be able to get into the right position. The cabin gets treated to a new touchscreen infotainment system, but other than that not a lot else has changed. You still get the same driver-focused 5-dial instrument layout and high centre console, while fit and finish is faultless as always. The interior is also well-built. You’re probably not too concerned about practicality if you’re shopping for a roadster, but it’s always a bonus when a small sports car manages to reward you by being practical as well as powerful. This is the case here. In case you’re not the type of individual who already has a family car and just wants a roadster to play around in, this Porsche Boxster can be fun and useful at the same time. It come with two boots – a 150-litre one at the front and a 130-litre one at the back – as well as plenty of storage spaces, including a good-sized glovebox and two cup holders. There are, though, no rear seats. Standard equipment across the range is pretty good, starting with the standard model which gets 18” alloys, a 7” touchscreen, air conditioning, a CD stereo system and sports seats. The Boxster S adds 19” alloys and bi-xenon headlights, while the GTS comes with PASM suspension, a Sport Chrono package, and better seats and interior. The Spyder variant stands out with its own bodykit, which includes carbon-fibre bucket seats, sports suspension and unique rear buttresses. It does, however, do without a radio and air conditioning to save on weight. The optional extras list is extensive, but not everything is insanely expensive. You can, for example, pick up a small plastic wind deflector for £200. However, adding the sat nav will set you back an extra £2,000. Prices for the new Porsche Boxster start out from £40,000, and rise to almost £53,000. For more information on our leasing deals, check out our page here. In terms of running costs, the Boxster offers reasonable returns, especially in standard guise. The cheapest engine to buy is the 2.7-litre, and it can achieve returns of 34.4mpg while costing £265 a year in road tax. The bigger 3.4-litre petrol, meanwhile, is good for 32.1mpg, which still isn’t bad for a car with this much performance. If you fancy the new Boxster Spyder, you’ll have to deal with average fuel economy returns of 28.5mpg and an annual road tax bill of £490. You will get 370bhp, though! Porsche have switched to four-cylinder engines for the new Boxster, but before you get up in arms (again) about that, remind yourself that the Porsche’s first ever road car had only four cylinders. It may have lost two cylinders, but the Boxster is as sharp to drive as ever – the steering rack is 10% more direct. The engine line-up has been given a massive overhaul and includes some really meaty stuff. A chassis makeover further contributes to making this a machine a real powerhouse. Yes, the switch to four cylinders means you lose some of the Boxster’s famous character. Let’s take a look at how the car matches up against two of its nearest rivals in the comparison section of our Porsche Boxster Roadster review. 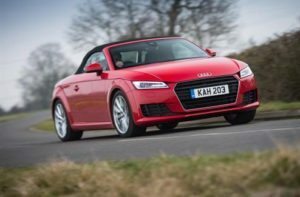 The new Audi TT Roadster looks sharp, drives sharply, and boasts an exquisite interior. There is only one car that’s better to drive in this sector than the Audi TT Roadster, and that’s the Porsche Boxster. So if you’re not convinced by the Porsche, the Audi is a very good alternative. It weighs the same as its predecessor, handles just as well, and performs just as well. What you get out of the TT Roadster depends on how you drive it. Push it to its limits and it won’t be as agile as it could be. Keep it smooth and brisk, and it offers plenty of fun. There are some explosive engines in the range, but the 2.0-litre TFSI 227bhp is the one that’s best suited to public roads. It can do 0-62mph in 6.2 seconds with front-wheel-drive and 5.6 seconds with four-wheel-drive. For as much speed as possible, the TT RS is your man. Powered by a blistering turbocharged 2.5-litre petrol engine, it thrusts you from a standstill to 62mph in just 3.9 seconds before maxing out at 174mph. There is also a diesel engine available – a 2.0-litre 181bhp variant that offers decent acceleration, and can get you from rest to 62 in 7.3 seconds. Unsurprisingly, it’s the cheapest engine to run, and can achieve fuel economy returns of 61.4mpg while costing £130 a year in road tax. The 2.0-litre TFSI petrol is reasonably economical too, and averages returns of 45.6mpg. The TT’s interior is easily one of the most beautiful in this class. The virtual cockpit is a highlight; it’s essentially a 12.3” high-def screen that buses all your data and configurations in one neatly arranged place. It frees up space and looks fresh and modern. It might take a bit of working out to get used to, but once you’ve used it a few times it will become second nature. Roadster’s in general are not super practical, and the TT is no exception. However, neither is it entirely useless. There are no occasional rear seats, while the boot measures a respectable 280-litres. Storage spaces include a decent-sized storage cubby located in the arm rest, and a few narrow pockets in each door. The new BMW Z4 Roadster looks great and is good fun to drive. However, it lacks a diesel and is showing signs of ageing. Despite the lack of a diesel, there are still plenty of powerful engines to choose from. The Porsche Boxster is more engaging, though. The 2.0-litre petrol engine powers the entry-level Z4 sDrive18i, which also powers the sDrive28i. Delivering up to 154bhp, it’s got enough in its armour to get you from rest to 62mph in just under 8.0 seconds before maxing out at 131mph. Not exactly the quickest, and it also feels breathless up hills. A 181bhp variant is much quicker, and does the 0-62 dash in 6.9 seconds before topping out at 146mph. For more pace, the 242bhp is an option – it blends performance with decent economy and can gun you from a standstill in 5.7 seconds. A large 3.0-litre petrol engine delivers 302bhp and does the same distance in 5.2 seconds, while the sDrive35is rounds off the range, doing 0-62 in 4.8 seconds. Without a diesel engine in the range, fuel economy is not as good as it could have been. 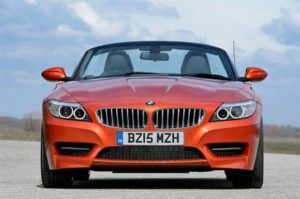 You won’t have to pay through the nose, though – the BMW Z4 Roadster is cheaper to buy than the Porsche and offers reasonable economy. The cheapest engine to run is the base-level 2.0-litre, which can achieve average returns of 41.5mpg while costing £185 a year in road tax. The BMW Z4 is strictly a two-seater. It’s reasonably practical, and comes with a good amount of standard kit. Inside, the cabin feels special – the materials are top quality and durable, while the brand’s iDrive wheel is, as always, a highlight. It controls the infotainment system, sat nav among other things. The Boxster is more practical on the whole. Whereas its roof can be tucked away in less than 10 seconds, the BMW’s takes over 20. And when you do put it down, you lose a considerable amount of boot space – it drops from 310-litres to 130. There re just two seats, but they should offer enough comfort and space to the driver and passenger. Now over twenty years old, the Boxster is single-handedly responsible for boosting Porsche’s customer base. However, many were drawn to the six-cylinder engines – which have now gone. If you can overlook that aberration for a moment and give the new car a test drive, we’re certain you won’t be disappointed. Handling is sharper than ever, performance is blistering, and a revised engine line-up is fearsome. Add in bigger brakes and wider tyres, and the new Porsche Boxster Roadster is an absolute monster. Speak to a Vehicle Specialist! Fill out the form below with your details and one of our vehicle specialist will call you in 24 hours.